Numerous factors go into what causes the signs of ageing on our skin, including genetics, lifestyle choices, and how much time you’ve spent in the sun. There’s a lot you can do to prevent, or at least slow, these signs, and it starts by using a great skin care routine. Such a routine will treat your skin to a wealth of beneficial ingredients, but equally important is what you eat. Many of the same ingredients that are good to put on your skin are also important to include as part of your diet. They bring additional benefits to help you fight the signs of ageing, from the inside-out. Adding these nutrients goes a long way toward helping you achieve more radiant, youthful skin (and a lot of these healthy ingredients come in delicious forms, too). Some of the most important components you can add to your diet to fight signs of ageing are antioxidants. A wealth of research shows that eating foods rich in antioxidants has all sorts of health benefits, including defending skin from the ravages of environmental damage. Environmental damage causes skin to appear older, so anything you can do to thwart it helps skin look and feel younger. Fruits and vegetables are great sources of antioxidants, like vitamins C and E. Berries, dark leafy greens, beets, carrots, and beans are just some of the antioxidant-packed foods you can incorporate into your diet (green tea is also great). 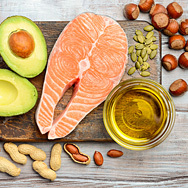 Omega fatty acids, particularly omega-3, omega-6, and omega-9 fatty acids, can help boost and strengthen skin, in part because they serve as building blocks for skin’s surface layers. The stronger these layers are, the better your skin will look now and years from now. Omega fatty acids are found in fatty fish (like salmon, mackerel, and tuna), flax seed oil, soybean oil, canola oil, and sunflower oil. If you’re not a fish eater, mixing up a salad dressing that includes one or more of these plant oils is a great and easy way to add omega fatty acids to your diet. Or ask your healthcare provider to recommend a fish oil supplement. Trace minerals are essential for maintaining health and preventing both internal and external ageing. Many of these trace minerals have antioxidant benefits as well. They include iron, zinc, copper, selenium, and chromium. Some mineral-rich foods you can incorporate into your mealtime are dark greens, nuts, beets, eggs, oysters, beef liver, dried fruit (like raisins and apricots), beans, and flax seed. This is by no means a comprehensive list of all the foods you can eat that have anti-ageing benefits, but it’s a good place to start. Simply put, this type of diet can be incredibly tasty while doing great things for your skin’s appearance, not to mention your overall health. Dive in!